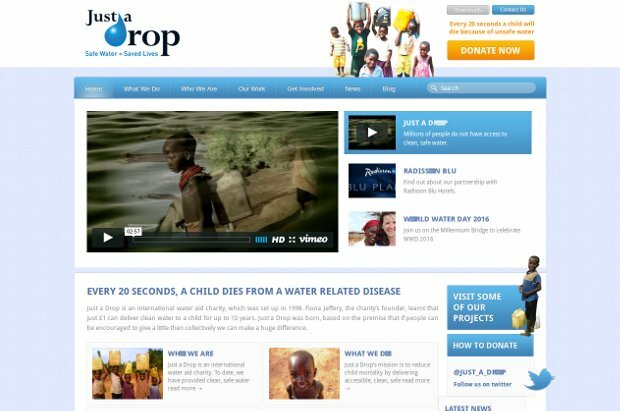 Just a Drop is an international water aid charity with a very simple plan: to give people clean water. It was founded in 1998 by Fiona Jeffery Obe when she learned that just £1 could provide water to a child for 10 years. She named the charity ‘Just a Drop’ to reinforce the premise that if people can be encouraged to give a little then collectively we can make a huge difference. Just a Drop’s mission is thus to reduce child mortality by delivering accessible, clean, safe water where it is needed most. Their projects support communities through the construction of wells, boreholes, pipelines, hand pumps and latrines and establish health and sanitation programmes for some of the poorest and remotest regions in the world. With the support of their volunteers and donors, coupled with a grass roots approach, they are committed to making a real difference to people’s lives through one focus – delivering safe water and sanitation to communities in need. Just a Drop is independent, non-campaigning and hands-on. They recognise that local ownership is vital to the sustainability of their projects and their volunteer field operatives work directly with local partners and communities to achieve this. Each project establishes community based structures for maintenance and management of the facilities over the longer term. In addition, they train local communities in hygienic sanitation practices such as hand washing. Where possible, they seek to directly link funders to specific projects in the field so they can see very clearly the difference their support has made.